Flip Out Mama: Holiday Gift Guide: Crayola Pop Art Pixies Review and Giveaway! Holiday Gift Guide: Crayola Pop Art Pixies Review and Giveaway! I have an adorable new line of crafty items from Crayola to tell you guys about! These are the Pop Art Pixes from Crayola, and they are soo cute! The Pixies are four tween girls: Skye, Maya, Tatum and Naomi, who are friends with their own unique styles and interests. Together they have 14 craft project kits, that allow young girls to create and express themselves however they choose! Meet Skye! She’s sweet, thoughtful, and always thinking of others and how she can help save the environment. She loves the outdoors, playing soccer, friends, wildlife and hiking. Skye’s Pop Art Pixies craft kits include: Create a Water Bottle, Wooden Charm Bracelets, Skye’s Herb Garden and Wind Chime kit. Meet Maya! A free-spirited young lady, Maya lets her inner creativity show and encourages everyone to express themselves without judgment. Maya’s Pop Art Pixies craft kits include: Create a Glass Pendant, Shadow Box Kit, Create a Water Color Frame and Create a Sun Catcher kit. Meet Naomi! She is big into technology and music, and can mix music with the best of the best. Music is her life and her DJ spirit inspires her desire to communicate more through actions and sounds than words. 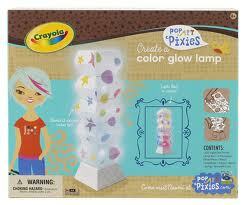 Naomi’s Pop Art Pixies craft kits include: Create a Stationery Box and Create a Color Glow Lamp. Meet Tatum! The bubbly, social butterfly of the Pixies and famous for her cupcakes, Tatum is fun-loving, outgoing and likes to host parties for her friends because everyday is worth celebrating. Tatum’s Pop Art Pixies craft kits include: Create a Decoupage Glass Plate, Party Lights kit, and Create a Mosaic Picture Frame. There are a ton of cute kits to choose from! Naomi’s Color Glow Lamp Kit includes a Pagoda-inspired plastic shade that girls can assemble, decorate, and transform into a one-of-a-kind lamp that lets their self-expression shine through! Perfect for display in their room, Naomi’s Color Glow Lamp casts cool, colorful effects that will enhance any décor. The lamp can be lit in two different ways – press the on/off button once and the red, yellow, green, and blue lights flash in a random pattern; or, hold the button down as the lamp changes colors and release it when it lands on the color you’d like to stay lit. The kit comes with 1 accordion shade, 1 base with LEDs, 1 mirrored cone to refract even more color and light, string to hold the mirrored cone, colorful decals to decorate the shade, and instructions. This one is probably my favorite! It was easy to make, and Tater even enjoyed helping me with it. I love the fact that you can light the lamp two ways. I really like it with the color changing lights best. This kit is different than most craft kits that are on the market, in the fact that you can actually make something to USE later, instead of just something pretty. I really like this one a lot! Skye’s Wind Chime Kit will turn a favorite outdoor spot into a colorful sanctuary complete with the sound of tinkling chimes when the wind blows. The kit includes two birdhouses, so the girls can spend together-time planning and painting with their BFF, or tackle both pieces by themselves. Included are six pots of DecoArt Patio Paint, a paintbrush, 8 aluminum rods to create the chimes, 2 decorative wooden pieces (a bird and a butterfly), string, and complete instructions. Skye’s Water Bottle Kit lets girls put their imaginations in motion as they decorate a reusable water bottle that reflects their style and concern for the environment. The kit includes one 500 ml aluminum water bottle with cap, 1 carrying clip, 6 pots of DecoArt gloss enamel paint, a paintbrush, 4 stencils, and instructions. Tatum’s Decoupage Glass Plate Kit provides tweens with yet another reason to get together, get creative, and get out the good dishes when the gang comes over to hang out! What could be more fun than designing your own party plates that reflect your style and taste? The kit comes with 2 square plates and 1 round plate, 3 unique design sheets, 3 sheets of printed wrap paper that allow girls to cut out their own designs, 2 oz. of decoupage medium, a paintbrush, and instructions. The decorated plates will even hold up to repeated hand washing! Maya’s Glass Pendant Kit gives girls two ways to express their creative side. They can design a trés chic piece of jewelry that they can enjoy wearing and even redesigning when their taste – or their outfit – changes. Plus, they can decorate a pendant holder and display it in their room, showing off both pieces to their friends and family! The kit includes 1 glass pendant, accessory beads, 6 Crayola Recoloritz markers, 6 easy-to-change acetate disc designs that girls can change to match their mood, and two 30-inch nylon cords in black and brown. Maya’s Shadow Box Kit lets girls express their inner artist in more ways than one! They can paint their personal shadow box and create art for the interior with materials included in the kit or with mementos they’ve collected. The kit includes 2 wooden shadow boxes, 3 design kits, 35 foam squares to create a 3-dimensional look, 6 sheets of colored pattern paper, 4 pots of glass paint, a paintbrush, wood varnish, and instructions. And this isn't even all of them! There are more kits too! Pretty much anything your tween may be interested in, you can find a Crayola Pop Art Pixies Kit that is perfect for her! If you think you might like to get a Pop Art Pixies Kit for your tween, go here to receive a $2.00 off coupon! Crayola and MyBlogSpark are giving away a Pop Art Pixies Prize Pack to one lucky Flip Out Mama reader! One reader will receive Tatum’s “Decoupage Glass Plates” kit, Naomi’s “Create a Color Glow Lamp” kit, Naomi’s “Create a Stationary Box” kit, and Skye’s “Create a Water Bottle” kit!!! Yay!!! 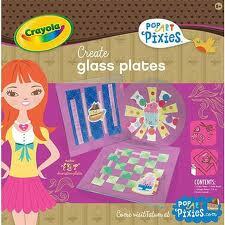 Of all the Pop Art Pixies Kits, which one do you think the girl in your life would like the most? Go here to see all the choices! +1 Extra Entry PER DAY! Tweet about this giveaway, post it on your facebook, write a blog post about it... Then come back here and leave a comment with a link to your post. You can do this every day for an extra entry every day! Contest is open to US residents only. Contest will end on 1/10/2011 (WEIRD!) at approx 10 pm. Winner will be chosen via random.org and will have 48 hours to respond to email notification or an alternate winner will be chosen. Sponsor will ship the prize, and I am not responsible for prizes that are damaged, lost, or otherwise not recieved. Thank you for entering! Tell your friends! disclosure: I received these products, information and the giveaway from Crayola in conjunction with MyBlogSpark. All opinions are my own, and no monetary compensation was received. 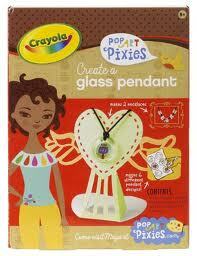 I would like to get Skye's Charm Bracelet Pop Art Pixies kit for my daughter. I like the Tatum’s Decoupage Glass Plate Kit. My daughter would like Tatum. Oh my gosh, they are all great. I'd have to go with Skye's Herb Garden as my first choice. I see some Crayola shopping in my future! My daughter would love Skyes Herb Garden. My daughter would love the glow lamp one.Thanks for the chance. I think my girls would like the shadow box kit the most. the kids would love to play with these.looks like so much fun.i subscribe email.thanks shelly robelady@hotmail.com the shadow box is neat. We'd like the wind chimes! I think my daughter would like Maya's Shadow box the best! I think my daughter would love Tatum's Party Lights kit! I think my daughter would like the color glow lamp kit(I know I would like it!). I think my daughter would most relate to Skye. My daughter would love the Skye’s Water Bottle Kit since she could use it in the car. Thanks! I think the she'd like the glass pendant kit the best. My daughter would probably like the Crayola Color Glow Lamp kit the best. 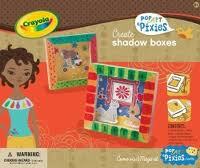 My daughter would love the Maya’s Shadow Box Kit. I like Tatum’s Party Lights! I like the color glow lamp the best. I really love the wind chimes kit! My daughter's favorite kit would be Naomi's Stationery Box! 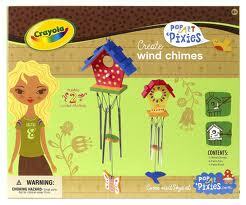 My daughter would totally dig the wind chime kit. She's all about the wind chimes lately. My daughter would love Naaomi's Color Glow Lamp Kit. I think my daughter would like the glass plates the best. My daughter would like the water bottle kit. I like the Party Lights kit. I like the Tatum’s Decoupage Glass Plate Kit for my neice! Crayola Color Glow Lamp kit, my daughter would have a blast! Thank you for the giveaway. I think my girl would like Naomi's Color Lamp the bestest. My daughter would love Tatum's Mosaic Kit. The Create a Glow lamp is the one my daughter is begging for.Thanks! I think my princess would probably like the party lights. My niece would love the Color Glow Lamp. I think my girl would love Tatum's Mosaic Frame kit! We love taking pictures and a custom frame would be awesome to make! These look like fabulous kits! Thanks for the giveaway! She's love Naomi's color glow kit. She likes the Tatum’s Decoupage Glass Plate Kit. I think she would like the wind chimes. party lights! they're so cool looking! I think my oldest daughter would love the Crayola Party Lights kits most! I think my daughter would like the charm bracelets the best. I think my daughter would like the Maya's Shadow box one the best. She would love Skye’s Water Bottle Kit.